"The subject of our illustration this month is Mr. Alexander Keighley, President of the Bradford Photographic Society and of the Keighley and District Photographic Association. He is a young man to occupy two presidential chairs, but has already shown himself to be an artist as well as a photographer. 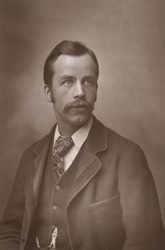 He will be known to most of our readers through his success in the last 'Home Portraiture' Competition of the Amateur Photographer; the work which he contributed gaining for him the distinguished honour of a gold medal at the hands of the late J. R. Herbert, R.A., A. M. Rossi, and H. P. Robinson. Mr. Keighley's skill as a writer is testified by the essay which accompanied 'Prize Pictures' (No. 1), in which were reproduced several of the photographs which secured him the gold medal referred to."